a human can work it out a web-bot cannot! New burgees now available, see Burgee page for details. 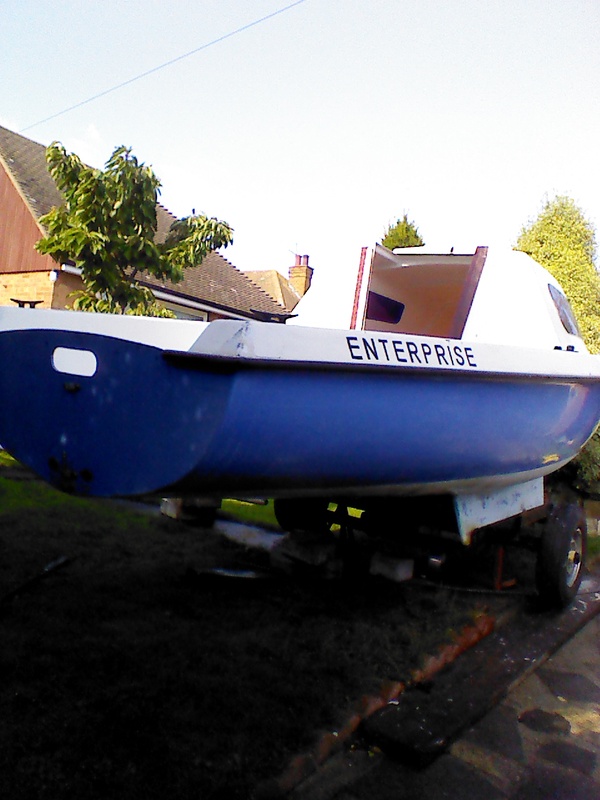 There is also a previous 'Boats For Sale' page to go there click here. After a 15 year happy association I’m thinking the unthinkable and floating Keppel on the market. She is believed to be the last built, but two. 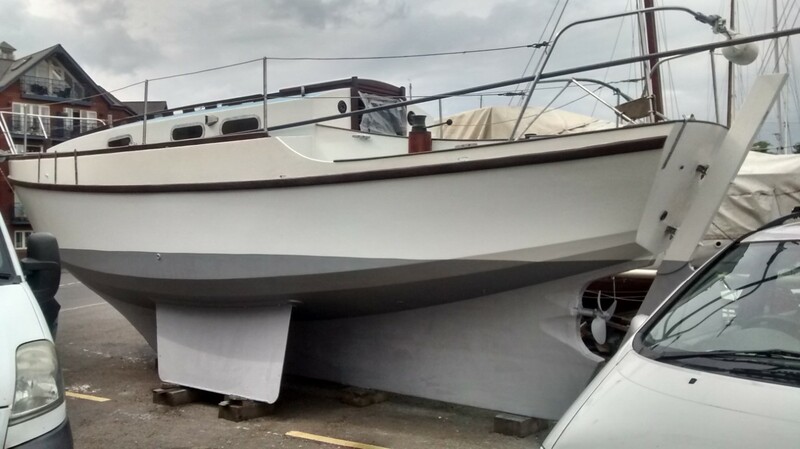 Home completed, the main core of the boat was constructed by Golden Hind Marine. She was the first of the last three to have the GRP aft section and cockpit as well as a GRP heads/shower and she was first to have the new balanced rudder. This makes her very manoeuvrable in close quarters. 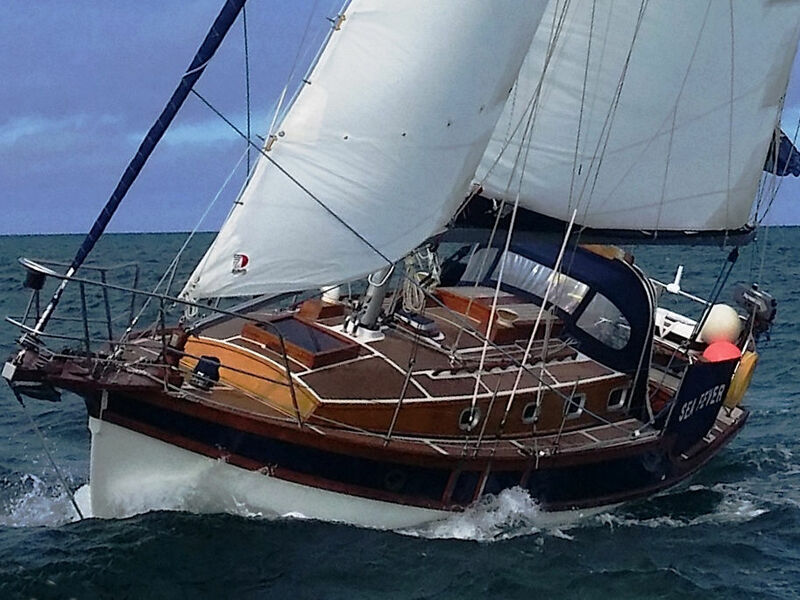 Keppel has featured regularly in PBO and, to a lesser extent, Classic Boat. Fitted out with an extensive inventory for liva-board cruising in hot climates particularly, she makes a cool; and comfortable home which she combines with good sea-keeping qualities. 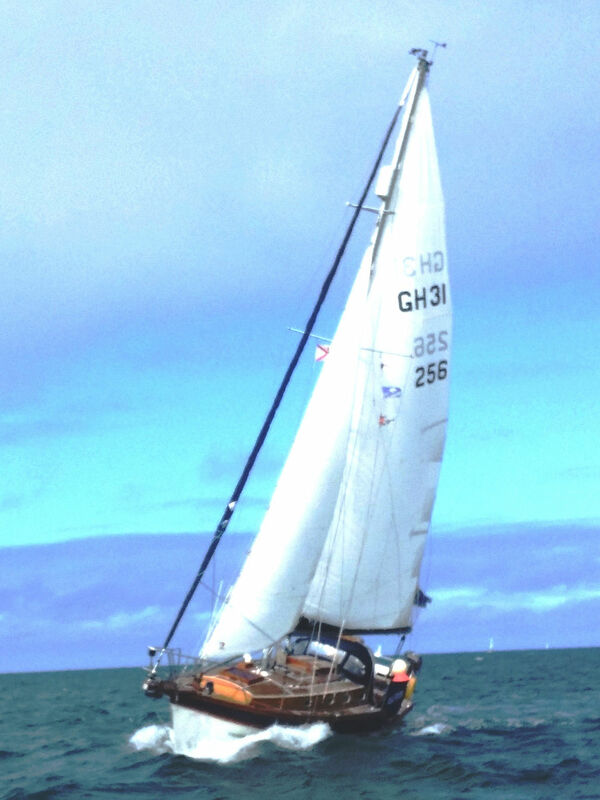 She has a sprightlier than normal performance courtesy of her larger than normal sail plan and aqua-dynamic foiled bilge plates. These plates have double the normal footprint width that, consequently, resist cheese-wiring into soft mud. Importantly, they are free of vibration at all speeds. She is also fitted out for inland waterway cruising. There is a very comprehensive spec’ which can be emailed on request. Included is a Nanni 29 engine (2000 but removed from boat and totally overhauled in 2013), a colorifier and shower, opening Vetus windows throughout. She has a 2-way opening forehatch, two bow anchor systems, independent of each of, for security and a kedge for Med mooring bows-to. 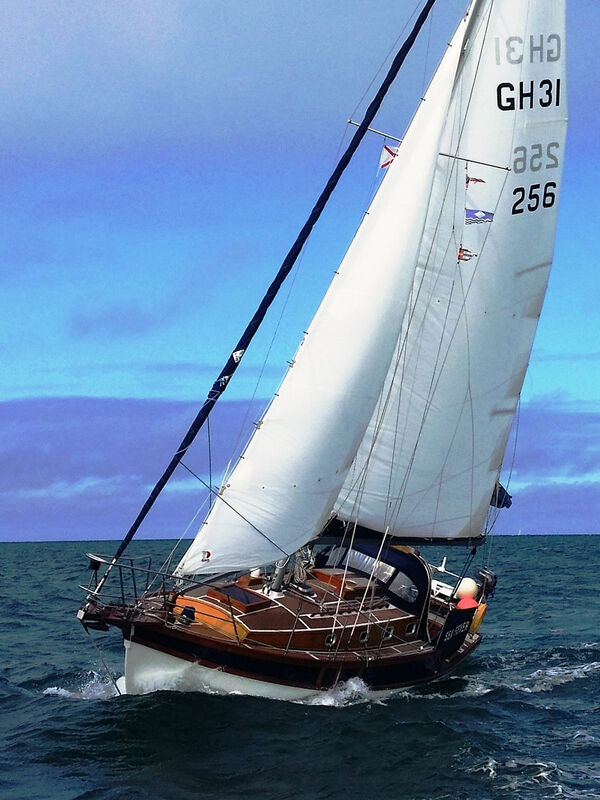 She carries a large tan genoa headsail but a demountable inner fore-stay is available for the snug heavy weather rig. To keep her in ‘60’s genre she has gold anodised spars. Engine removed and totally overhauled by Peter Norris in his workshop in 2013. Mast fixed rigging renewed and much of the running renewed by Larkmans in 2013. 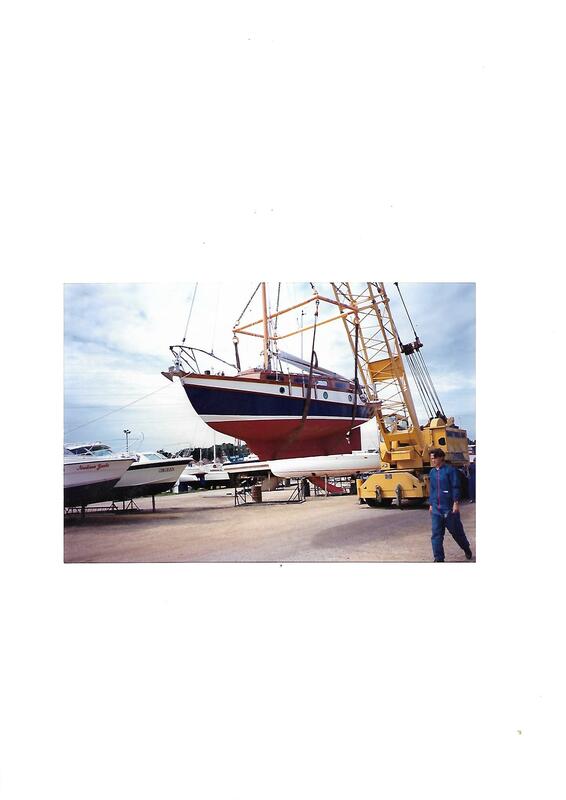 Treadmaster renewed buy Robertsons boatyard in late 2012. Her light and airy interior is fitted out using teak and iroko. She is currently based in Woodbridge, Suffolk. A comprehensive press cutting book containing over 150 full length features may be included. richard.hare at suffolkonline.net. Tel 01394 382270. 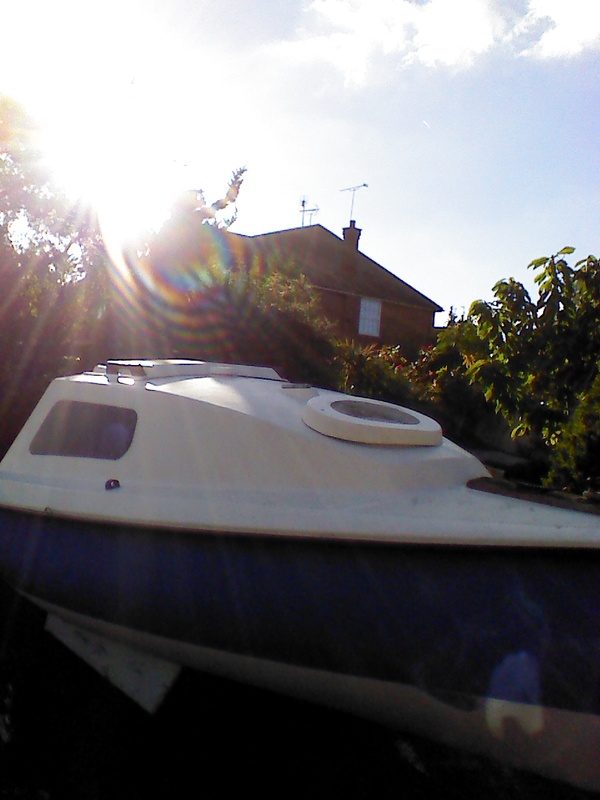 FOR SALE: 16ft GRP Sail cruiser 'Starship' class. 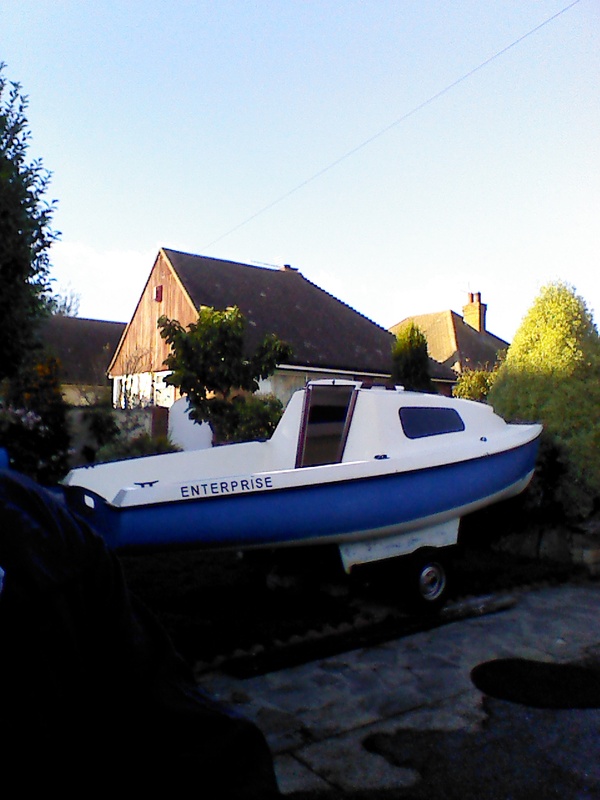 Yes, she is called 'Enterprise'!!! 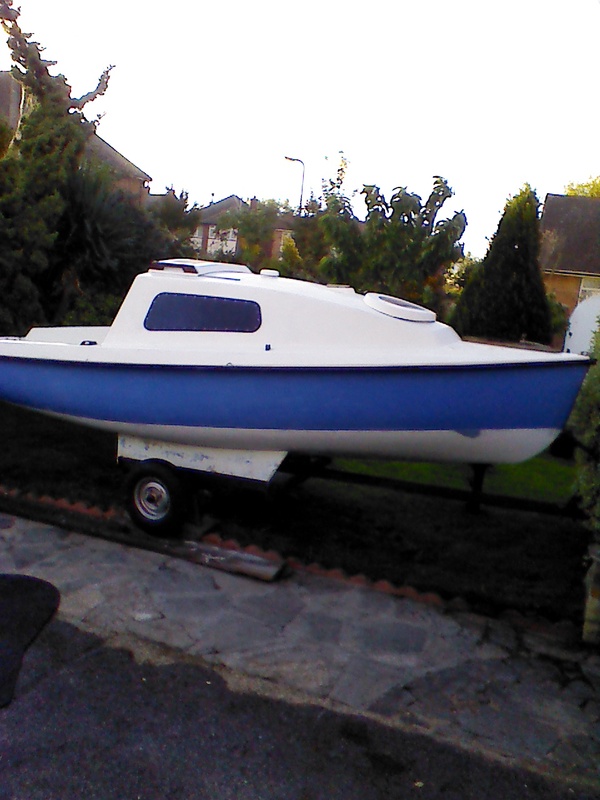 This GRP boat is a 1970's designed twin keel, 2 berth mini sail cruiser. 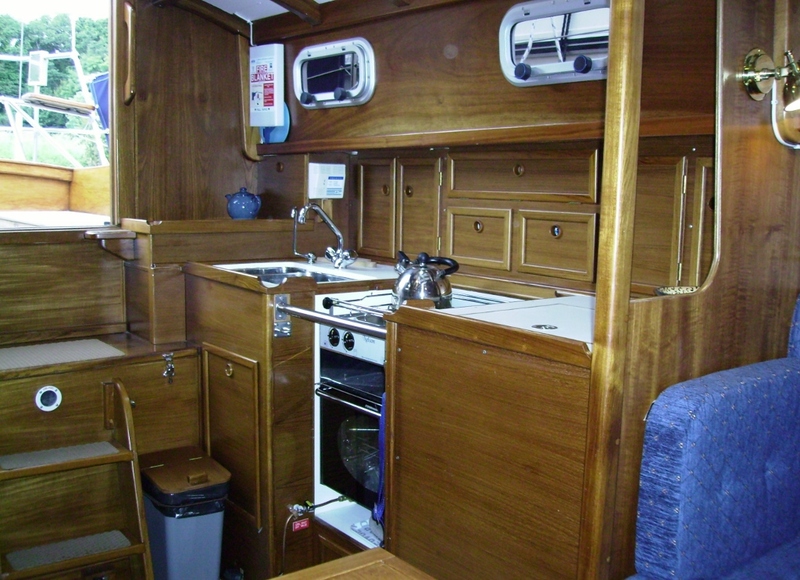 She has decent Ratsey and Lapthorn white terylene sails in store and red covered interior cushions and a small 2 burner gas cooker. Wide sliding hatch. Self draining cockpit. Opening fore hatch and cabin ventilator. Pair of emergency wooden paddles! Washboards renewed. Holt Allen rudder and tiller, Main marine mainsheet blocks. Deck scrubber, boat hook and deck mop! Mooring warps. 16ft long, 6ft beam and draft just over a foot! Designed as a small day boat trailer sailer, with the ability to overnight occasionally. Light enough to tow to the water behind a small car, so no mooring needed. All wire rigging. Boom. Two part mast. Needs an outboard, approx 4hp to power it. Sat on a road trailer, ashore, unused for many, many years. The trailer is on decent, just fitted, mini tyres with new bearings. Set of mudguards (and trailer board) needed. Cut down washing up bowl would do for mudguards.. Suspension is by 'Indespension'. A very basic boat that will get you afloat with very little work. Anchor and warp, switch panel and fuses. Comes with an assortment of Aqua signal navigation lights to fit. 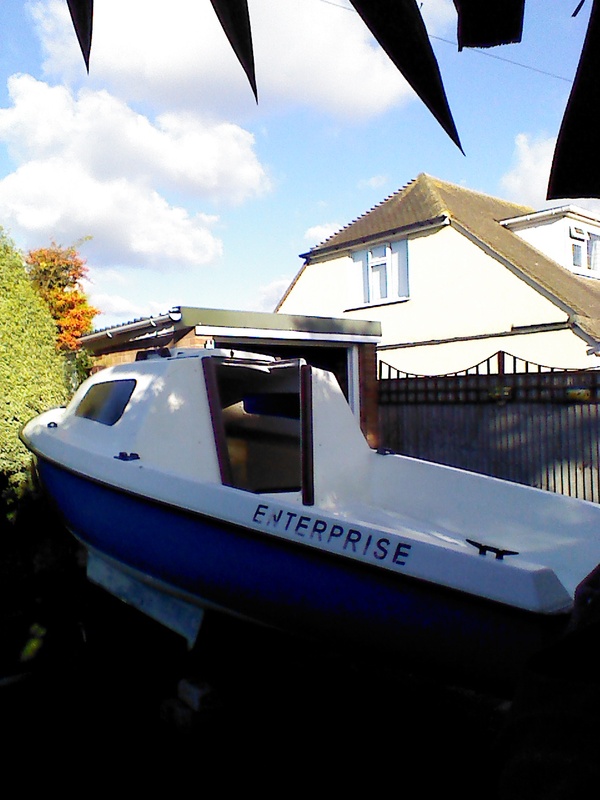 Boat in store in owners garden in Southend area. A truly unique opportunity. Built by my Company, Golden Hind Marine, on the last Golden Hind hull, GH256, before the moulds finally disappeared. She was launched in July 2013 and has been rarely used since then. She has completed only a one week cruise in 2015 and a three week cruise in 2016, so everything is virtually as new and the Yanmar 3GM30F engine has done only 250 hours. Unfortunately, advancing years with its associated problems, lack of use and scarcity of crew have forced me to accept the inevitable and offer her for sale. Solid mahogany cabin sides which result in a stunning appearance, the subject of many complimentary comments such as (quote) "You have the most beautiful boat in the port, Monsieur". An extended length cabin giving extra internal accommodation. 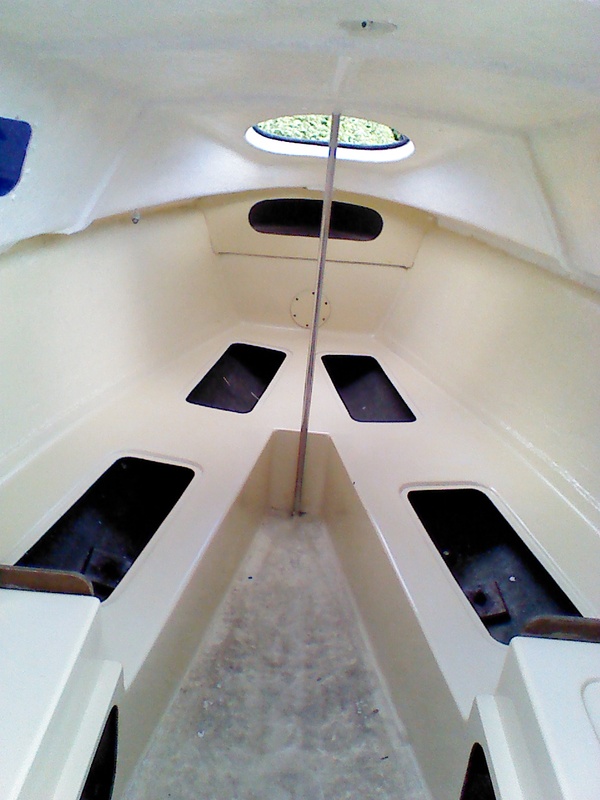 Encapsulated lead keel (One of only 3 that I am aware of, all produced by GHM), giving enhanced stability and the space for two custom potable grade, HDPE water tanks (186 ltr total capacity) beneath the cabin sole. Hull laminated throughout with Isophthalic, instead of the normally used and cheaper orthophthalic polyester resin, in a temperature and humidity controlled clean room. Blakes SFE 200 osmosis protection and a sacrificial grounding strip to the bottom of the keel applied in the workshop prior to the boat leaving. Double, above the waterline collision bulkheads in the bows. 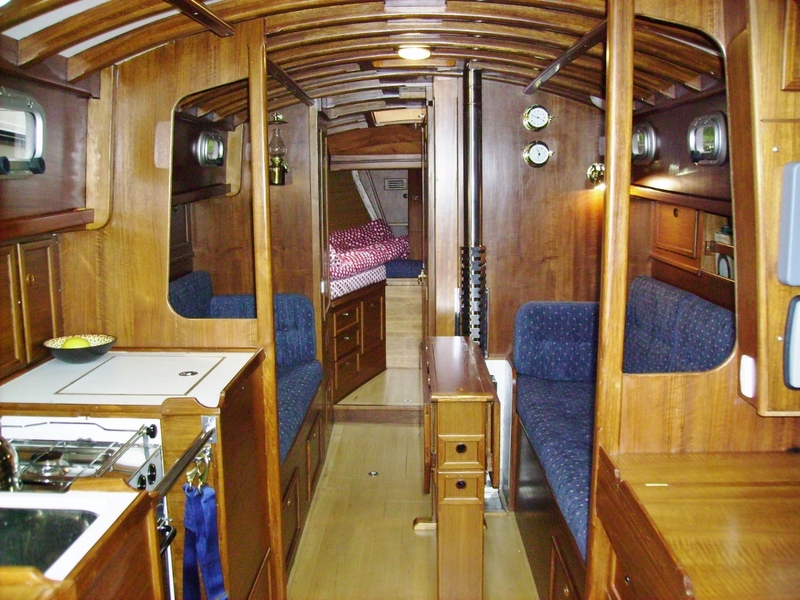 Saloon with two full length settee berths (one over 7 ft.) and lockers and bookcases behind. 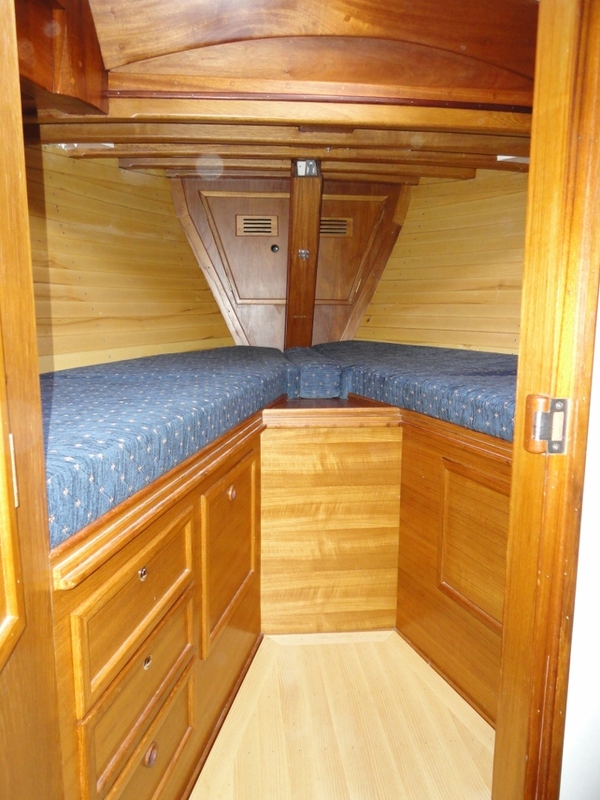 Forecabin with two full length berths, convertible to a very large double with matching infill and cushions. Swinging chain pipe clears berths if required. Hull sides panelled with light American ash. Nine Gebo category A aluminium framed windows, all opening and with optional mosquito screens. 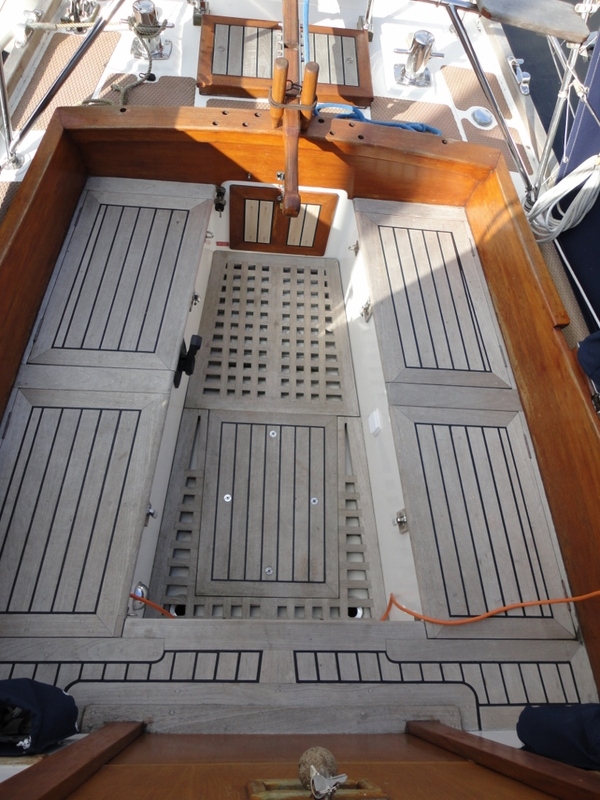 Gebo rectangular opening deck hatch above saloon table. 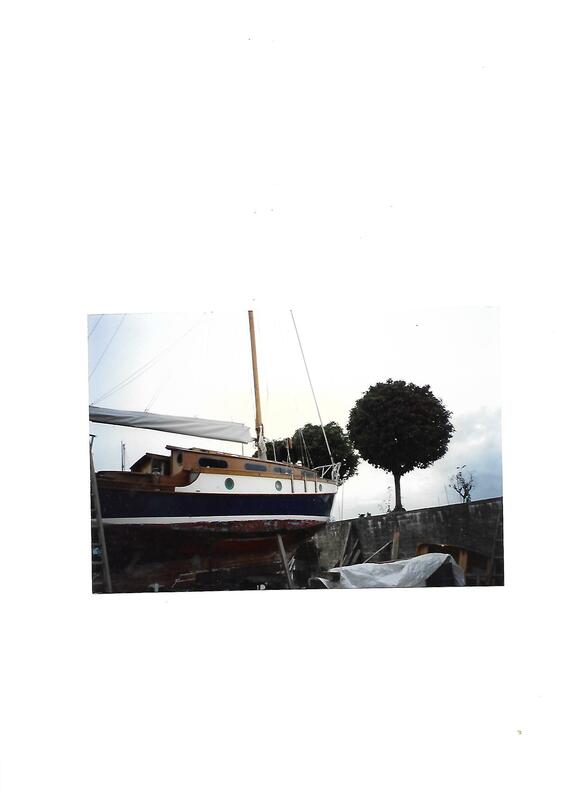 Teak, double coaming traditional "Maurice Griffiths" hatch to forecabin with canvas cover. Bronze portlights to forecabin berths with vanity shelves. 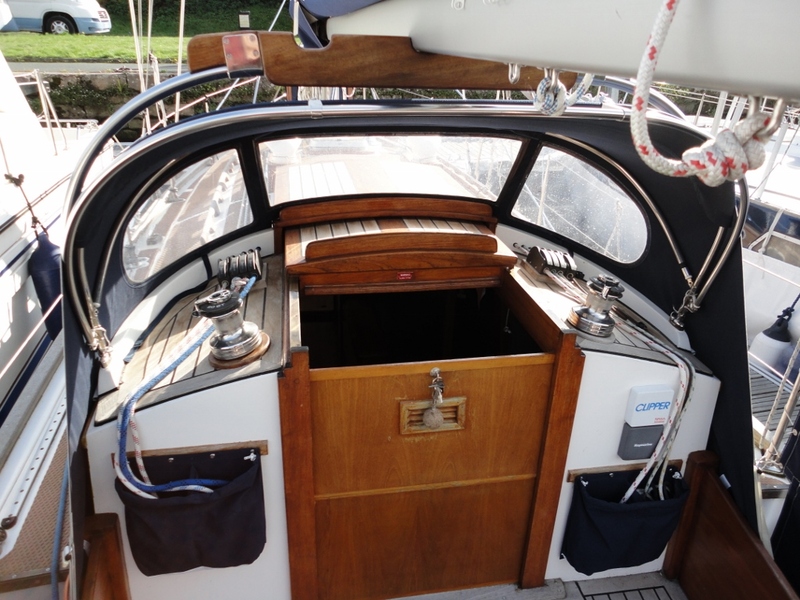 3xCowl vents on teak dorade boxes, with interior stainless steel butterfly shut-off vents. 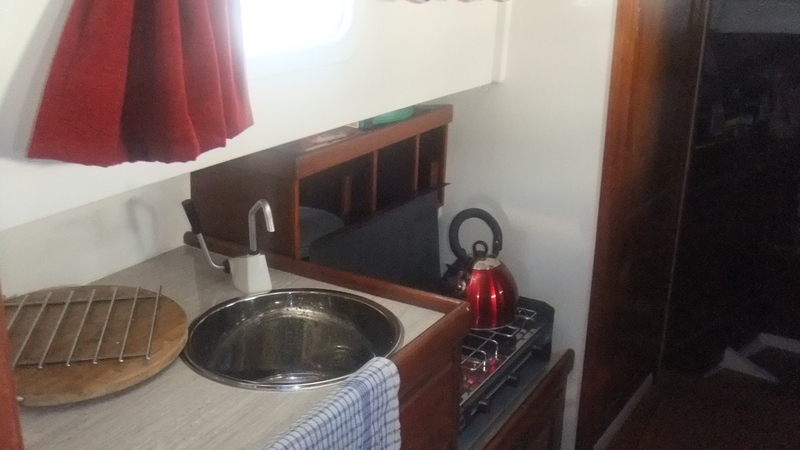 Galley with two burner stainless steel gas cooker with oven (unused) and separate grill, on gimbals with crash bar and galley strap, twin bowl stainless steel sink with pressurised H&C water, plus separate manual drinking-water tap with carbon filter. Large, high spec, very well insulated and economic Waeco Coolmatic ice box capable of freezing a 2 litre bottle of water! Heads with stainless steel basin, H&C pressurised water, shower with auto pump-out and Lavac toilet (new 2016). Holding tank with manual switch-over valves and manual overboard or shore side pump out. Forward facing ½ Admiralty chart table with navigators seat, electrical panel, Garmin GPS map 540, Nasa AIS/Depth/Log/SSB/VHF/Wind/Navtex. Raymarine Autohelm 2000 GT+. Lifejacket/harness locker behind seat. Separate wet locker to port on entry. 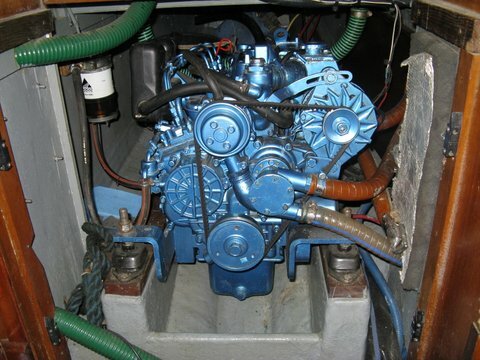 Yanmar 3GM30F diesel, (250 hours use) with pressurised H&C water. Aquadrive. Sterling Marine alternator booster. Two 65 ltr stainless steel fuel tanks. High spec bespoke spars by Sailspar. Single line, in-boom reefing with all sail handling from the cockpit. Sailspar Genoa roller gear. Folding stainless steel mast steps. Echomax radar reflector. Mainsail with Mainmate and lazy jacks, roller genoa and staysail, by Jeckells, all virtually as new. 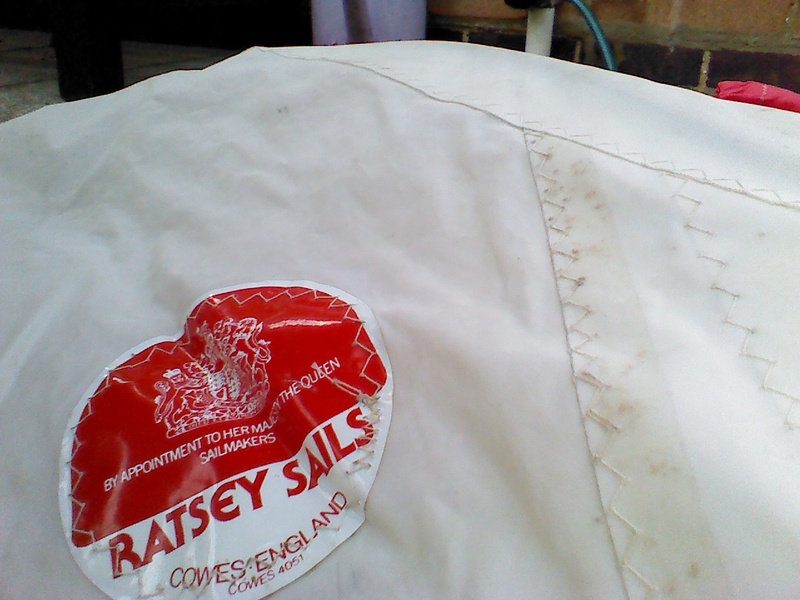 Staysail on self tacking boom and with sail cover (new 2016). Old, but unused storm trysail by Crusader sails. Sprayhood new 2015. Stainless steel and Iroko, wrap-around boom gallows, new 2016. Jackstays. 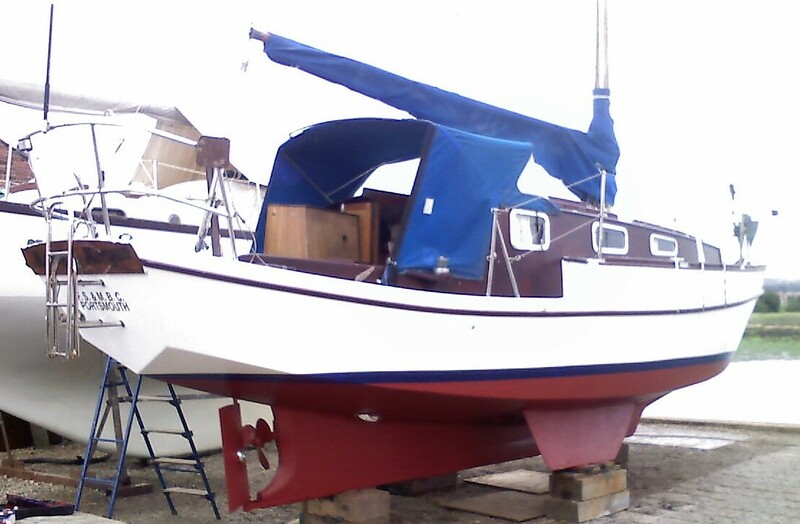 Enkes, stainless steel two-speed, self-tailing winches, 2x 22ASC genoa, 2x20ST on coachroof, either side of main hatch. One two-speed Enkes 18 on mast. High spec electrical installation. 110/240v shore power with ZincSaver II galvanic isolator protection, providing internal 240 V mains sockets, immersion heater and battery charger. Bespoke electrical panel by Taplin International including RCD and system/polarity check features. 3x110 AH sealed marine batteries, one reserved for engine start with 2X domestic batteries switchable to engine in emergency. 40A, Sterling Marine Pro-Charge D, switch mode battery charger. Very low power LED bulbs to all domestic lighting. Rutland 913 wind generator. 35lb CQR anchor with 120m 5/16" chain and 25lb CQR type anchor with chain/rope rode, stowed on bowsprit to split chain locker below. Chain pawl and SL Anchorman chain winch for 35lb anchor. 10 kg Bruce kedge anchor. Grapnel dinghy anchor with rode. Gas system designed, verified and tested by Abbas Gas, marine qualified engineer. Two bottle, butane gas locker in stern locker, accessible from deck and vented overboard. Bespoke locker installation by Gaslow Ltd., with independent bottle shut-off and switching, stainless steel marine regulator and Gaslow full-system leak detector. Twin sensor gas detector in galley area. RFD SeasavaPlus R four man liferaft in canister on teak stern-deck rack. 2.30m inflatable floor dinghy, new 2016 (used twice). Removable stainless steel stern-deck davits. Tohatsu 3.5 outboard, virtually unused. Two manual bilge pumps plus one auto/electric. Sold, ready to go, with ample warps, fenders, lifebuoys with lights, auto lifejackets, compasses, clocks, barometers, crockery & cutlery, fire and CO alarms, etc., etc. I hope this gives a fair indication of the quality of the craft. If you are seriously interested, please contact me for further details at: markurry2003(at)yahoo.co.uk. 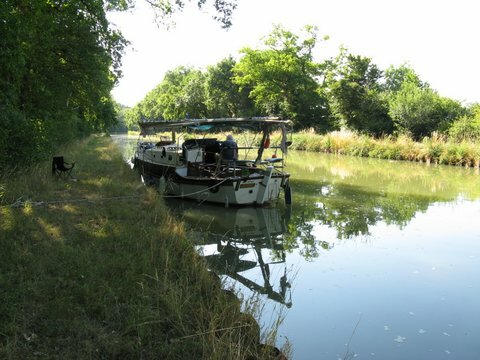 One year pontoon mooring in Pontrieux offered free to the purchaser, subject to an acceptable price being agreed. 'Domingo' was built by Seacraft in 1961 to a design closely derived from the Maurice Griffiths' Tidewater class. She is an auxiliary Bermudan cutter rigged sailing cruiser. Length Overall: 30'8" excluding bowsprit. 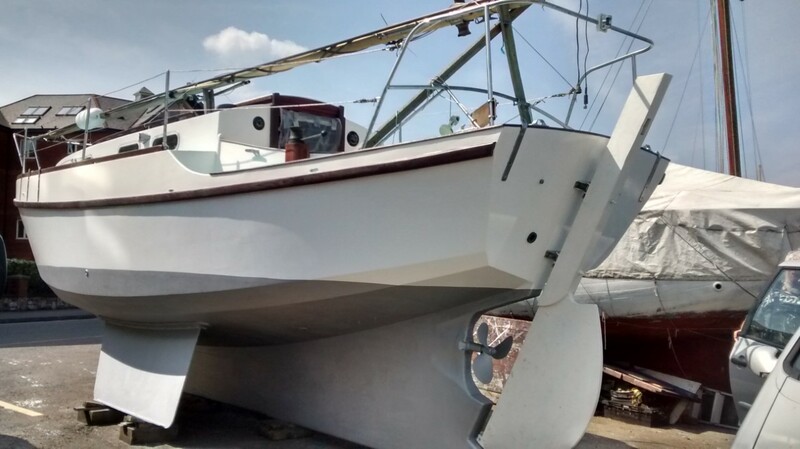 Domingo is conventionally laid out with a spoon bow, continuous sheer, non-immersed transom and round bilge hull with a long externally ballasted keel. There are small timber bilge keels. The rudder is transom and keel hung. Deck layout is also conventional with fore, side and aft decks with accommodation forward beneath a stepped coach roof and with a self-draining cockpit aft. Planking is carvel in Afromosia - fastened with copper nails clenched of copper roves. Timbers are in bent oak with sawn oak frames in place of every fifth timber in centre section. Centreline structures are in oak with galvanised mild steel and yellow metal fastenings. Ballast keel is in cast iron. Decks are Afromosia on ply with black PRC paying to seams. Deck beams are in oak. Cabin trunk and cockpit coamings are in Mahogany. Cabin top is in plywood and cascover sheathed. Cockpit is Mahogany and Iroko with trunk in plywood. o Toe-rails completely replaced with iroko. Original engine was replaced in 1983 with a BMC Commander 1.5L Diesel (40hp) with a PRM hydraulically operated gear box, with single lever controls (new and 1980). Engine is mounted on very flexible mounts and is connected to the shaft by an Aqua drive universal joint, with an independent thrust bearing installed in 1995. Engine has been regularly serviced and the raw water pump was professionally rebuilt in 2014. 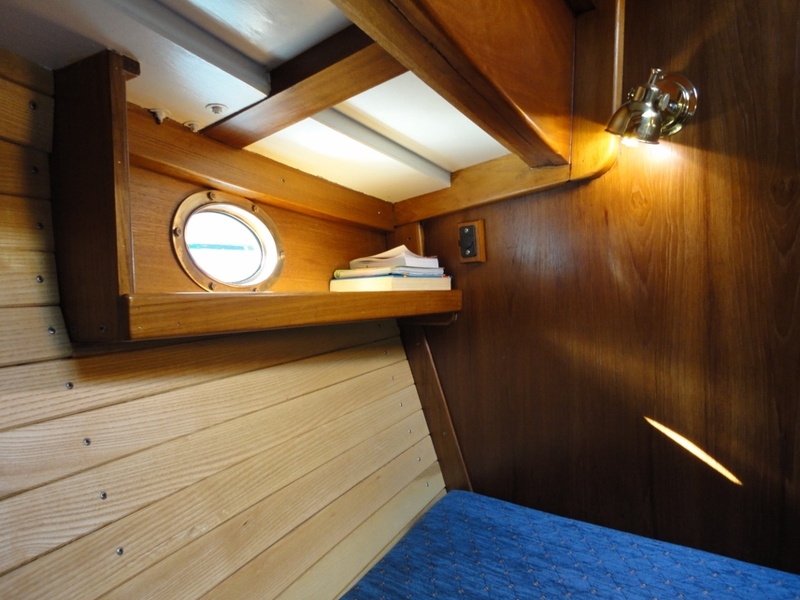 The fore cabin has conventional V berths with stowage forward and beneath. 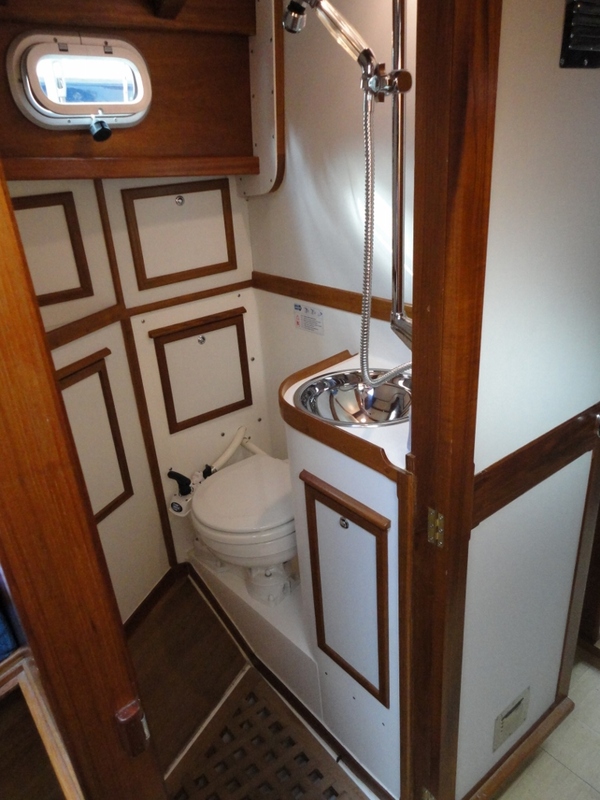 Moving aft is a heads compartment to starboard with a Baby Blake marine toilet and sink. With hanging space to port. 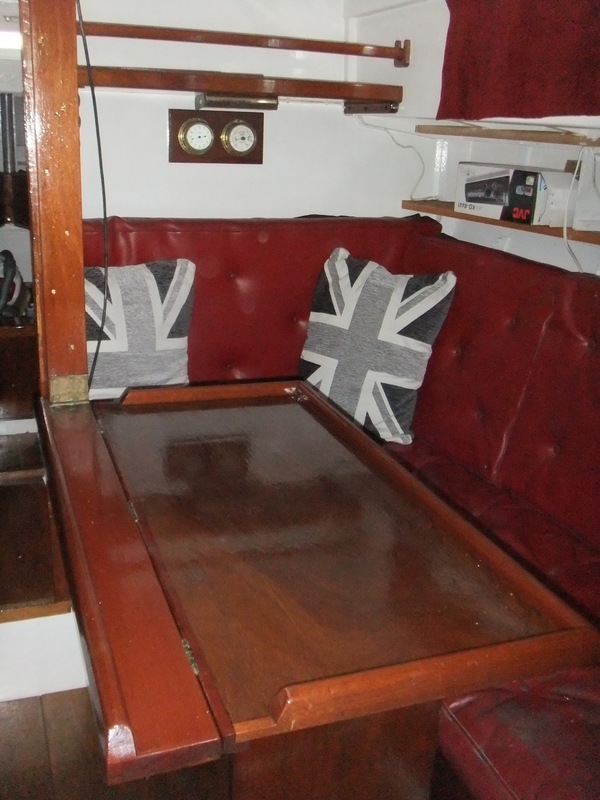 The saloon has a U-shaped settee to port which converts to a double berth. There is a centreline table with hinged flaps. On the starboard side is a further settee which can be used as a single berth - thus giving five berths. There are plenty of stowage lockers. 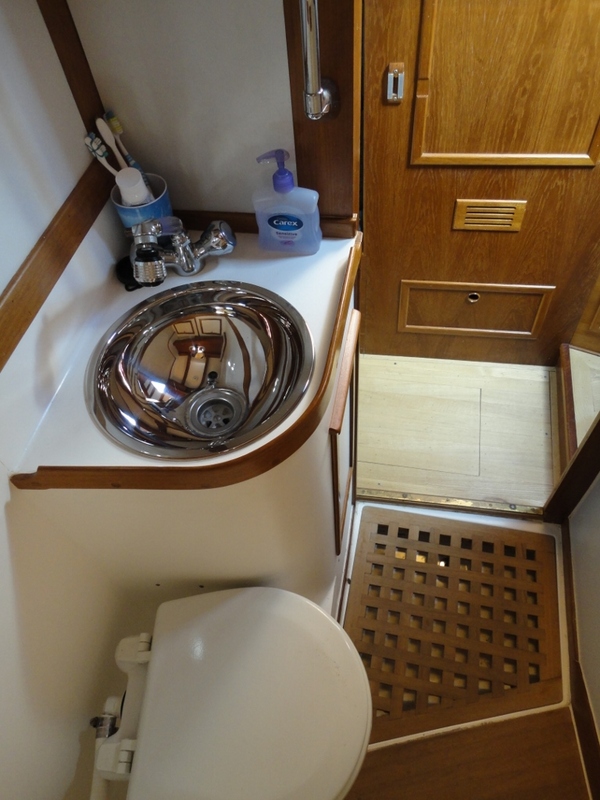 The galley area is to port near the companionway - single sink with sea water and fresh water - which is pressurise by an electric pump (new in 2009). The cooker is a single burner Origo spirit stove. The Bengco charcoal heater is not current installed because re-gloss work is in progress. 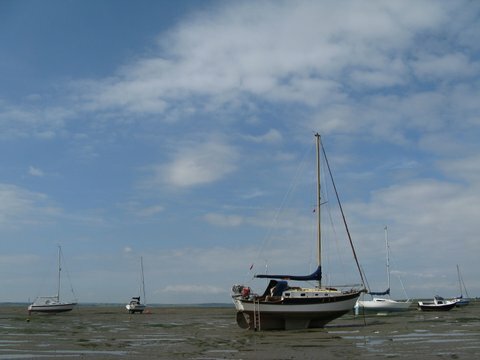 All berth cushions professionally replaced in 2009. Inner and outer forestays, with twin backstays. Cap and intermediate shrouds with fore and aft lower shrouds. Running backstays. It's all stainless steel and includes chrome bronze rigging screws. 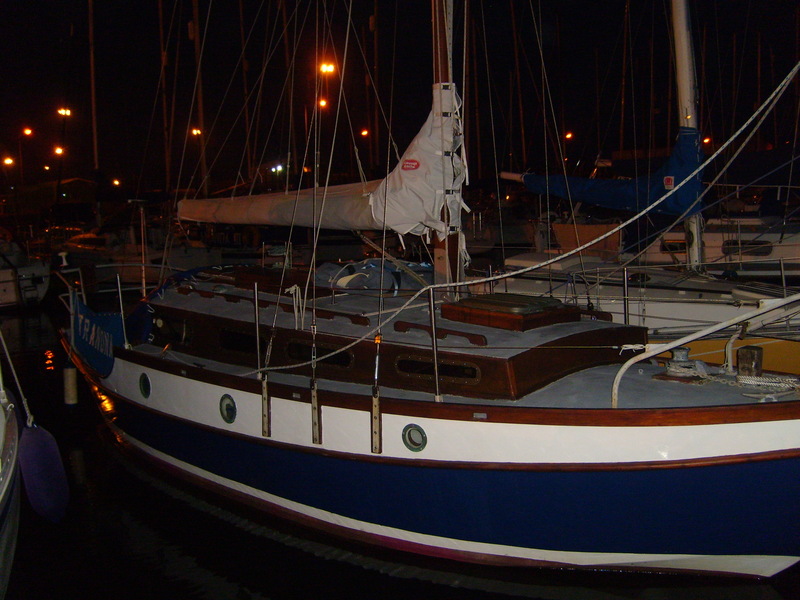 The fixed topmast forestay and aft lower shrouds were all new in 2003. Bowsprit shrouds were new in 1999. 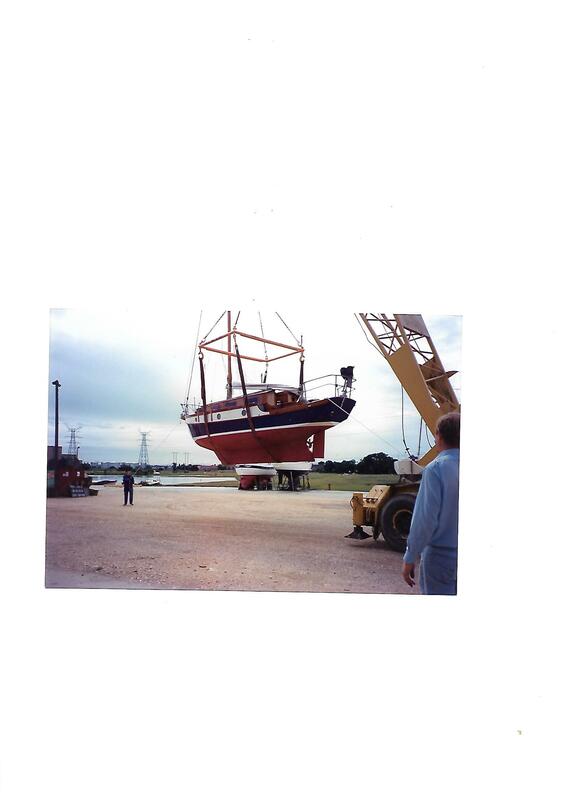 The portable top mast forestay and aft lower shrouds were new in 1996. 12v and 240 v ring main with modern circuit breaker. New domestic and engine batteries in 2016. Electric lighting was installed in 1999 - there are also three gimballed oil lamps. Main anchor - plough 25+ lbs. Kedge - fishermans 25+ lbs. Chain - approx. 100' of galvanised short link. Various warps and fenders. Bidata log/echosounder - new 1999. Boat hook and Ensign staff. 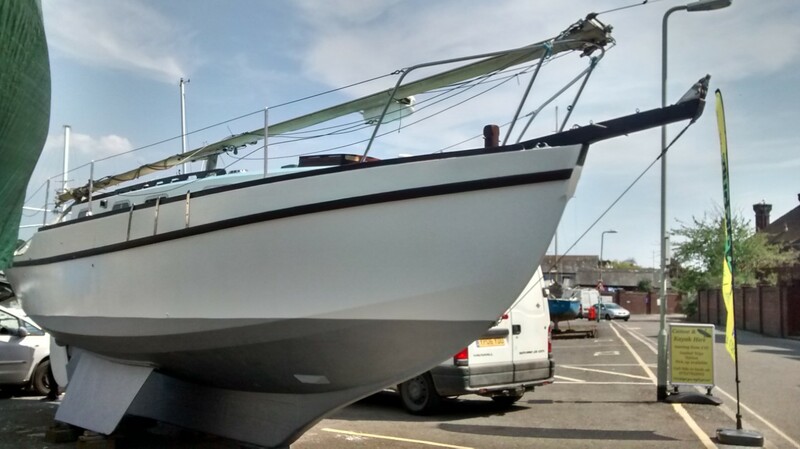 She is currently on local brokerage:- john at bjmarine.net in Northern Ireland. 'Goldcrest' has been laid up ashore for 8 years. 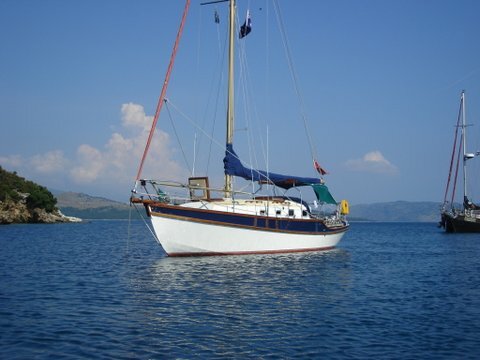 Built by a semi-professional as a traditional easily manageable family cruising yacht from 1978 and launched 1982. Hull, deck and frames constructed from marine ply sourced from Robbins, fastened with Cascophen and stainless steel screws. 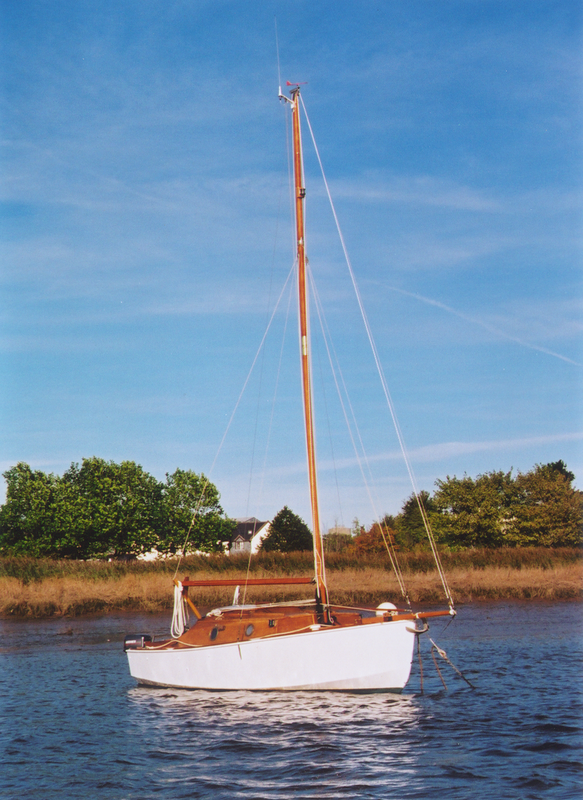 A greenheart and cast lead keel with steel bilge keels for taking the ground. She is the standard cutter rigged with a bow sprit, a vanished, laminated curved iroko stern, iroko cockpit and coach roof which is the extended version to improve her appearance and increase head room below. 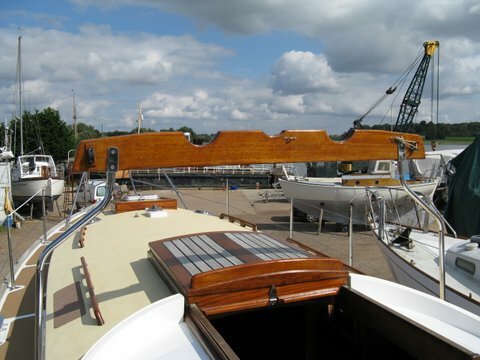 The rubbing strake is also iroko. The stem is iroko laminated and varnished. Decks are all finished in grey Tread Master. 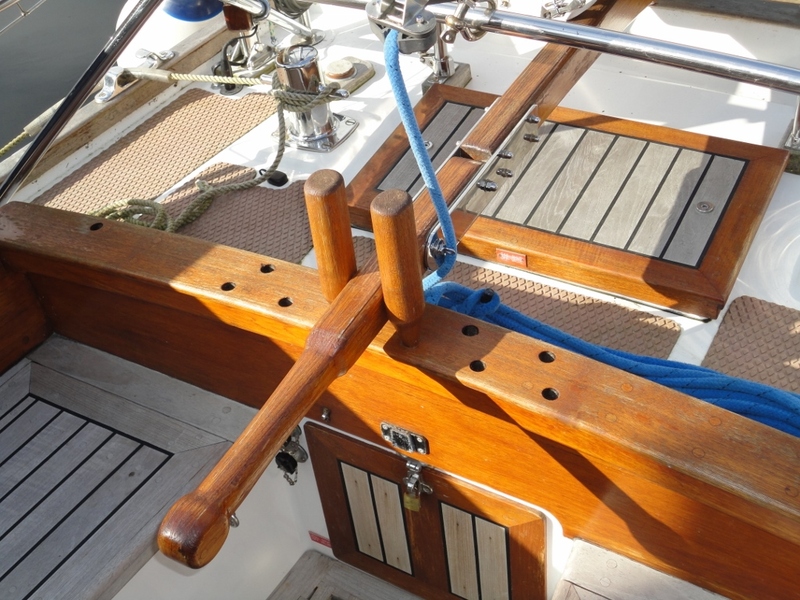 Mast, boom and bow sprit are all solid varnished Douglas Fir. 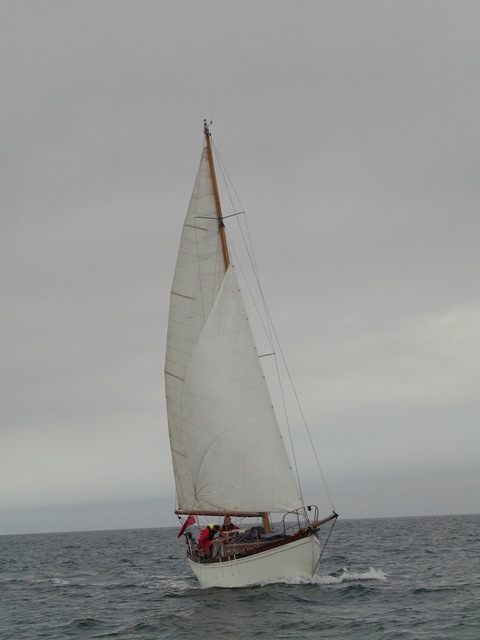 She has cruised the East Coast of Ireland, West Coast of Scotland, Irish Sea and North Wales. Due to illness, she has been laid ashore under tarpaulin protective covers for the last 8 years and regretfully now needs a new home to care for her and use her. 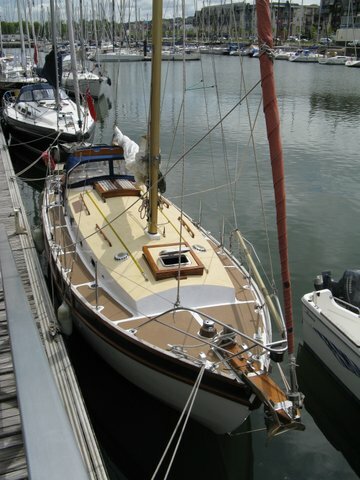 Jeckells in good condition, main with battens and slab reefing, No.1 jib and stay sail both on Wykeham Martin furling gear operated from the cockpit, No.2 jib (storm). All bagged. Petter Mini Twin ACW 2 WM 14 bhp. Diesel, water cooled, spare water pump, alternator currently removed for layup. Replaced a Lister engine in cica. 1995. Engine start and domestic batteries will require replacing. 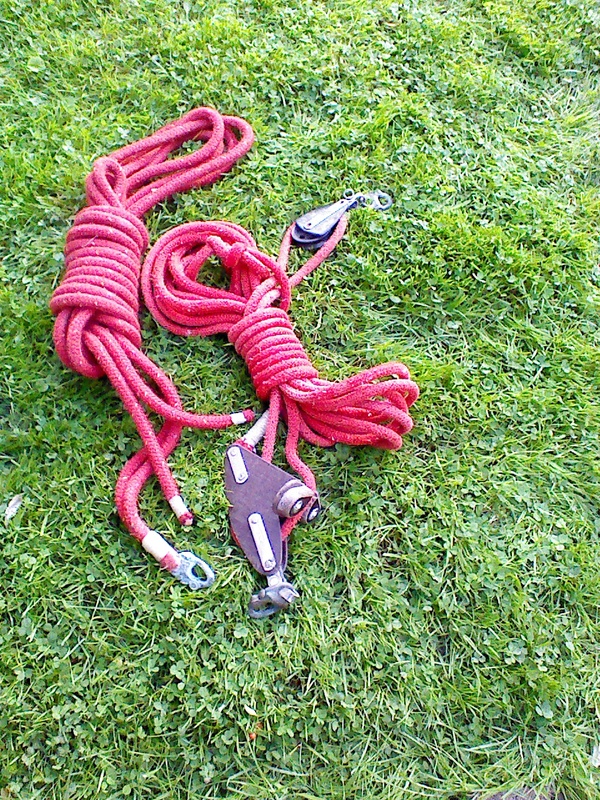 CQR with 30 m anchor plait plus 10 m of chain. Blake and Sons 079K stainless steel paraffin cabin heater. Auto-helm 1000 hardly used plus the power and fixing point in the cockpit. 2 No. solid life buoys. Full set of fitted bunk cushions finished in water proof vinyl. Number of berths 4 two in the saloon and two forward. 4 deck winches and 2 winch handles. All running rigging and galvanised standing rigging and bottle screws with require reeving and re applying to the mast they are currently stored undercover. The following are list for completeness and will require replacing. We can arrange economical, negotiable transport rates within mainland UK, the cost of which plus all cranage to be paid by the purchaser. 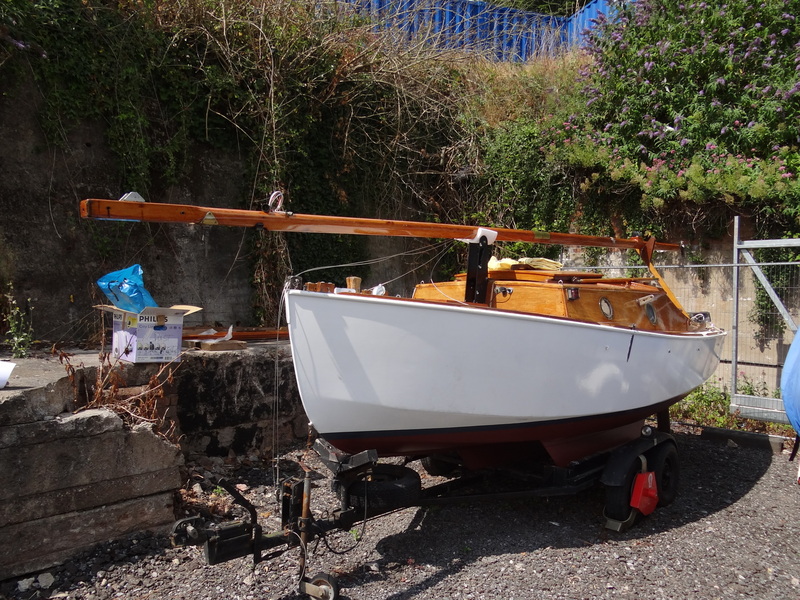 £5,000 but would consider part exchange for a day sailing boat similar to a Drascombe Lugger/ Longboat, Caledonian Yawl etc. Tom Edge Mobile 07831 805742. 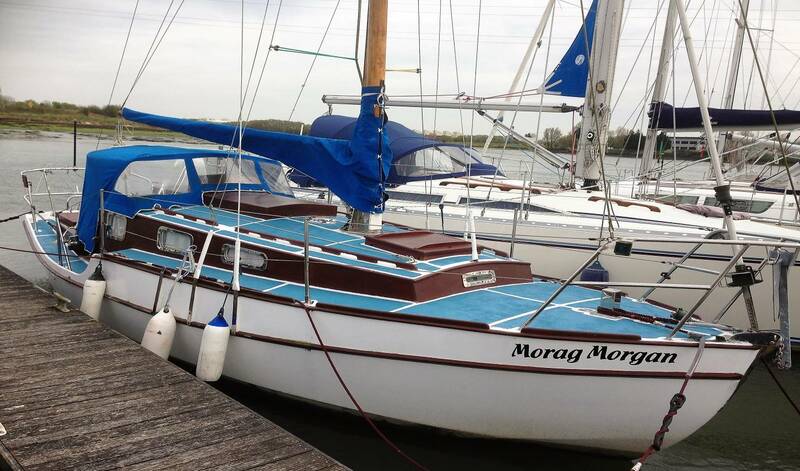 It is with sadness that, I must part with 'Morag Morgan', a very pretty, well equipped boat. We have been together for 38 years and she has served me well in all weather conditions. Professionally built in 1975, Certificate of British Registry 1976 No 366846. The hull being 12mm marine ply, glass cloth and epoxy sheathed (when built) to rubbing strake encapsulating long lead keel. 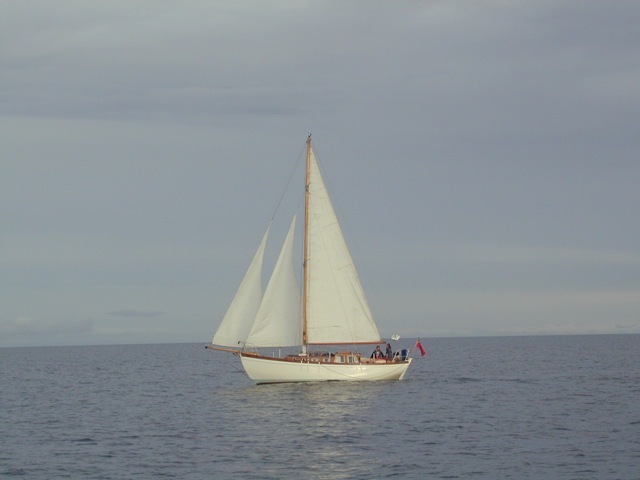 A well balanced sloop (no bowsprit necessary) built as cutter and can be easily converted back if required. 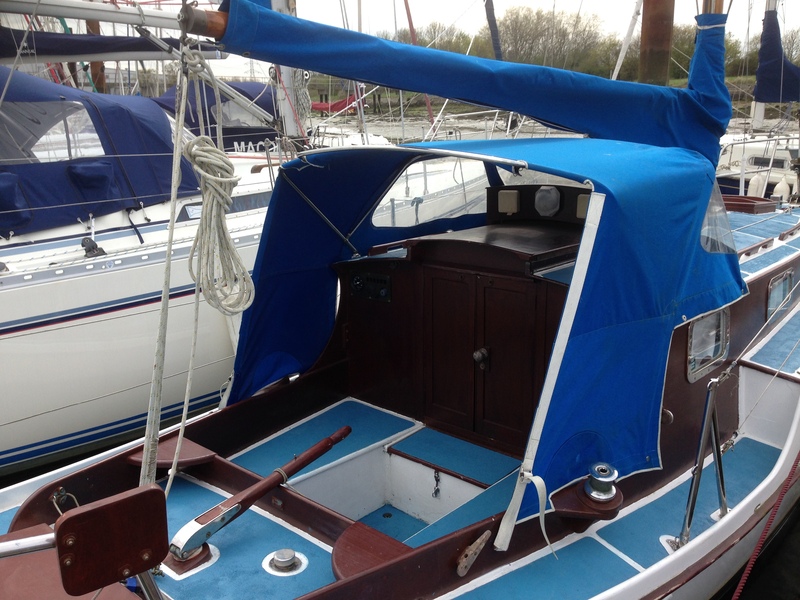 New mainsail, sprayhood and boom cover in 2014. Many Stainless Steel fittings including mast tabernacle, thro hull rudder, cleats, stem head fitting, samson post and window trims. The hull paintwork was stripped back and recoated with epoxy primer and polyurethane topcoat in 2010 and the interior was painted and re-varnished in 2013. A full specification, pictures and extensive inventory can be supplied on application. At the beginning of August, 2018 the boat will be in Holland. After two years at sea there are some things to do. WINE KNOT. 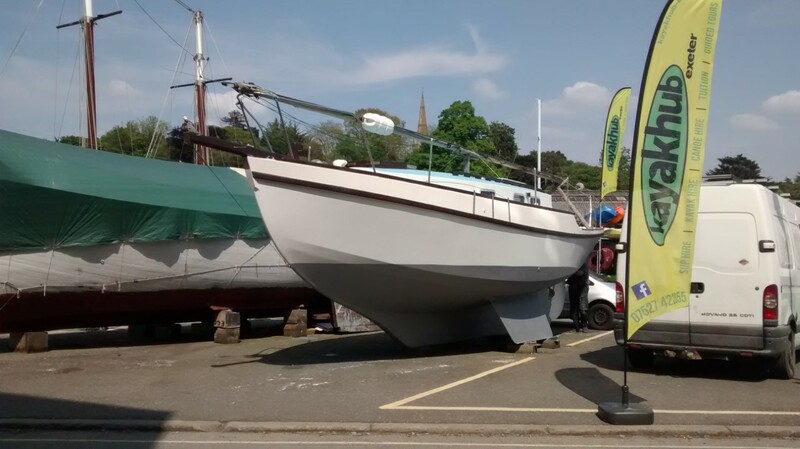 5 ton GH31 Sail No 21; LOA 31ft; Beam 9ft; draft 4ft. Built by Hartwells of Plymouth 1966. Slab reefing main. Roller reefing headsail. Cruising chute. Spare genoa. 4/5 berths. Nav lights. Cabin lights. Two Furuno GPS. Furuno radar. Firdell radar reflector. NASA echosounder. Clipper wind system. Bulkhead compass. Two anchors. Quicksilver 4-man inflatable dinghy. Sprayhood, cockpit cover. Build in 1966, by Hartwell/Erskine shipyards in Plymouth. Plywood on hardwood frames. Nylon sheathed from new. (cascover). 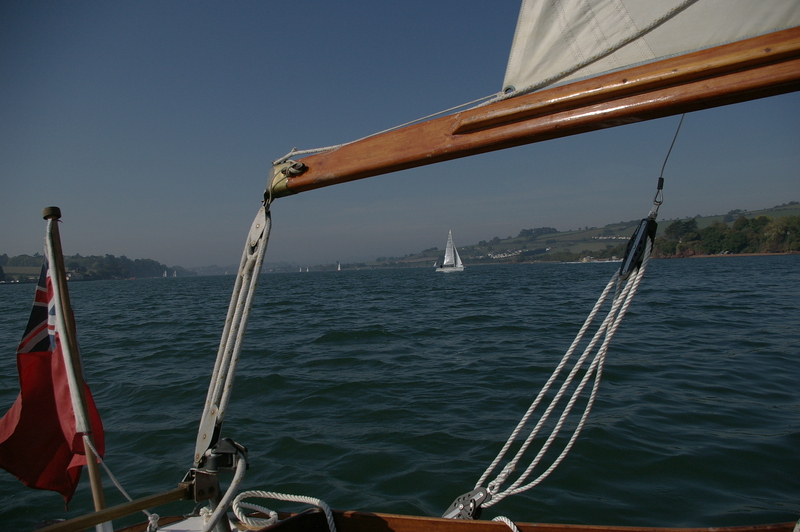 Bowsprit was added in 1982. New rudder made in 2015. Electric system renovated and renewed in 2005. Standing rigging renewed in 2009. Length overall 11.20 m (without bowsprit 9.70 m). Beam 2.70 m; air draft 11.50 m; depth 1.07m. 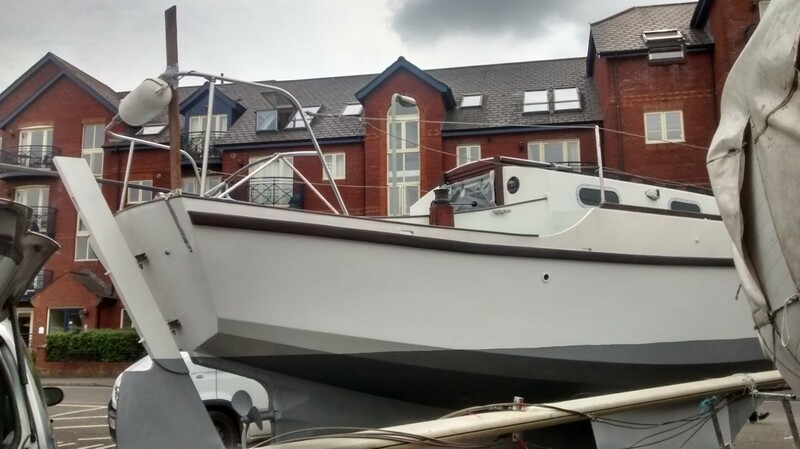 For Sale: Golden Hind 31 'Mallibee'. Sadly for sale, due to my poor health. 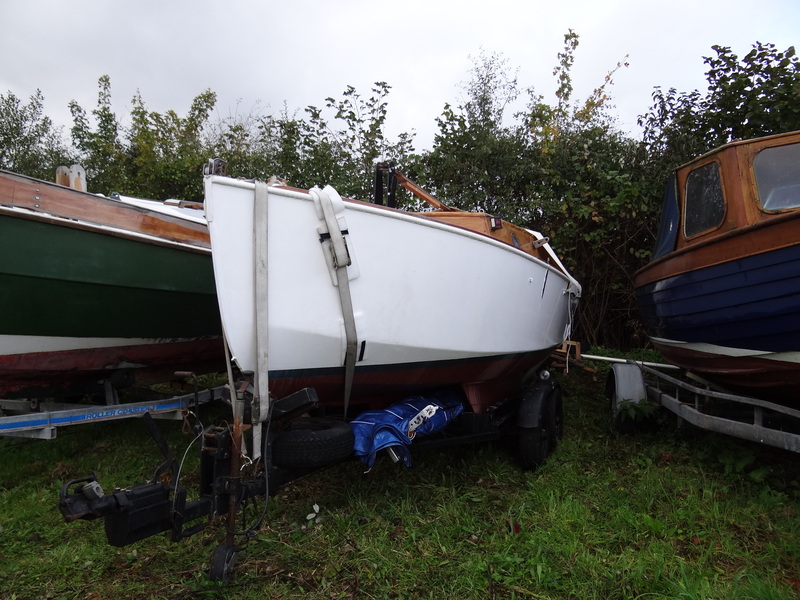 The boat is in good usable condition, bilge keels, bottom has been underwater undercoated ready for the new anti-foul next spring. She has a very nice working Bukh 20 HP engine. 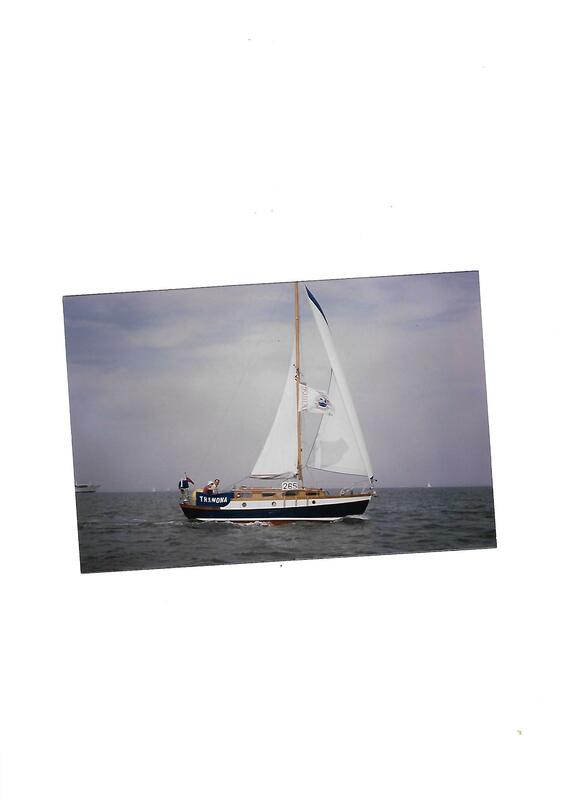 Cutter rig with bowsprit, furling head sail system and there is a full set of sails all in sail bags plus an extra almost new Main and furling head sail. 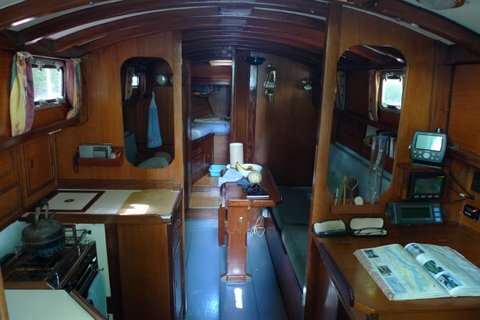 She has five berths, with a sea toilet, the interior is in generally good condition and there is a paraffin cooker with stainless steel tank. All the seating, mattresses cushions, curtains etc. are in good condition and have been removed, as have the sails and dry stored in our spare bedroom at home during the winter. During this summer the bilges have been cleaned and painted, and new automatic electric and hand pumps and filters fitted. All of the through hull fittings have been double clamped with s/s clips. A 240 v shore power system has been installed with RCD fuses box. A new 12 v battery charger has been fitted. There is a towed log and steering compass. The anchor is good and is at home, I think it will need new chain for next season. She will need two new batteries. A lot of time and money has been spent of her and I think she is in generally good usable condition, she was painted this year and the wood work treated. The boat is dry inside and no damp. She now needs a new owner, she is in East Devon. There is also a quantity of new electronics, Chart plotter, GMDSS Radio, fish finder and other general equipment, safety harnesses, New mooring lines etc. which I will make available for a reasonable price (50%) to the new owners, they can then take or leave what they do not want. 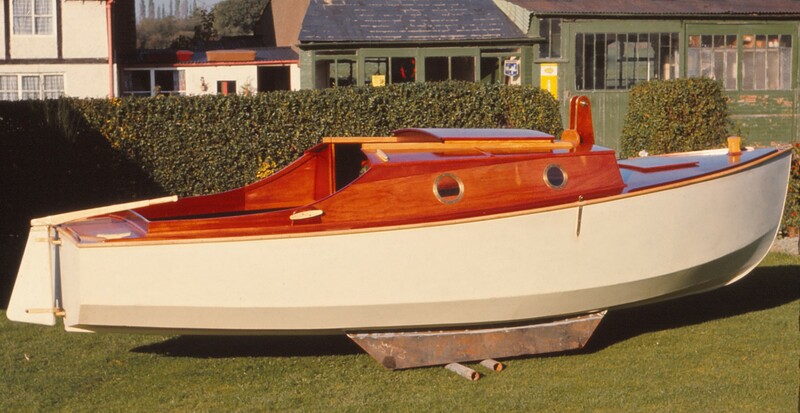 Built in 1963 by Hartwells in Plymouth, 'Tranona' was the first boat built to the definitive plans for the 26. 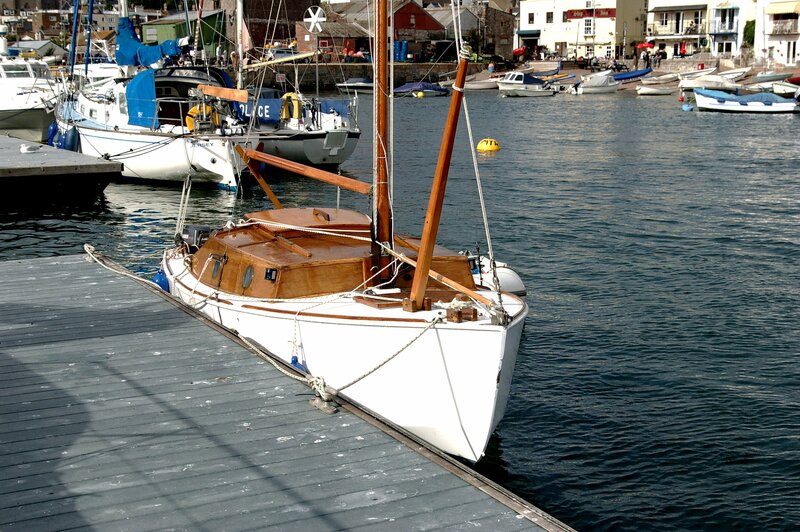 Commissioned by a doctor in Salcombe she was built out of the very best materials available at the time with the hull Cascover sheathed by the makers (now Wessex Resins). This means that she has survived in excellent structural condition. 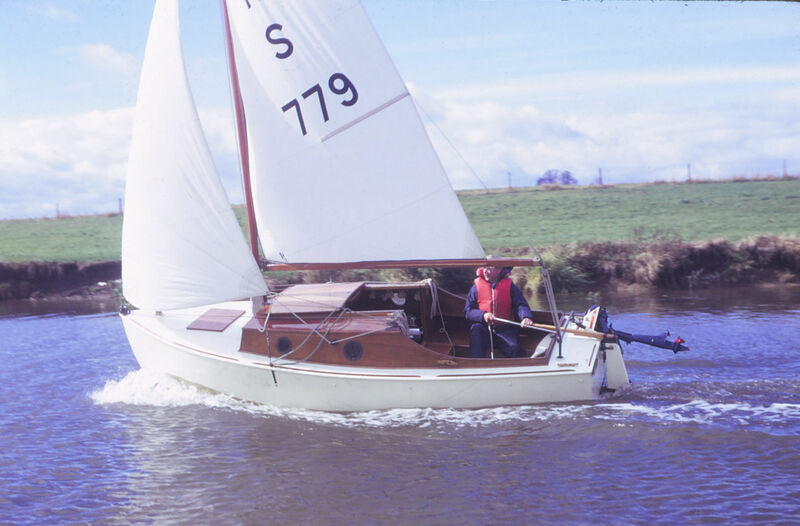 I carried out a major refit in 1992, extending the coachroof forward of the mast and most importantly removed the bilge keels and deepened the central keel to give a draft of 3’6”. 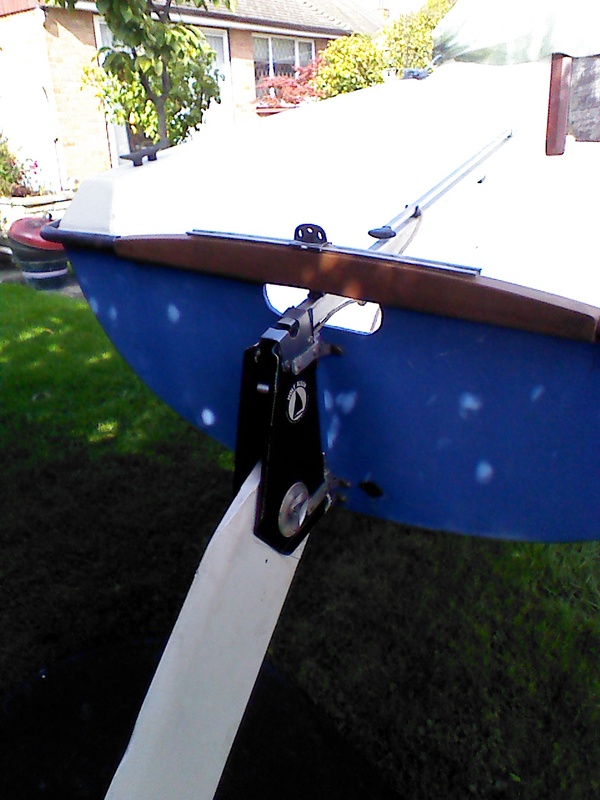 At the same time the keel was extended to the deeper skeg and a new, bigger and better rudder built. The underwater profile can be seen in the photos. 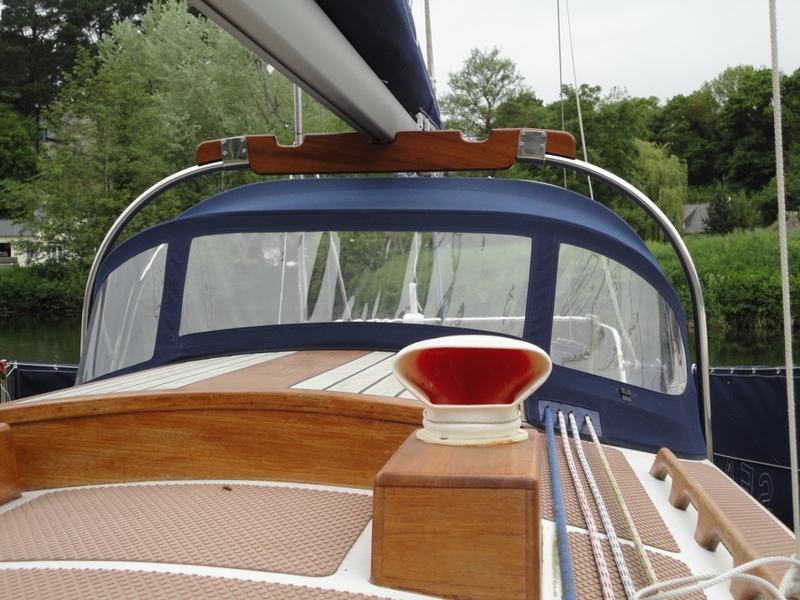 These modifications were a complete success, allowing an increase in sail area, all of which gives a level of performance and balance that is a step up from the usual shallow Eventide. At the same time the engine was replaced with a new Yanmar, complete rewire with a custom control panel, split charging system and instruments. All sail controls lead to the cockpit and a set of Lewmar bronze winches fitted. 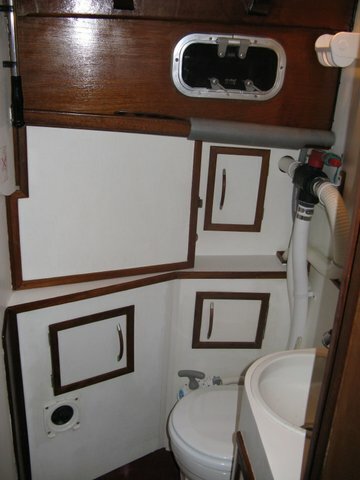 The interior has the usual 4 berths, galley with Taylors 030 cooker, toilet with Lavac and holding tank and a Victory paraffin heater on the forward bulkhead. In 2010 I started another refit ready for my retirement and replaced the Yanmar with a new Nanni 14 and a feathering propeller. A 4mm teak veneer deck has been laid. The hull was blasted and the Cascover sheathing re-fared with epoxy following advice from Wessex Resins. 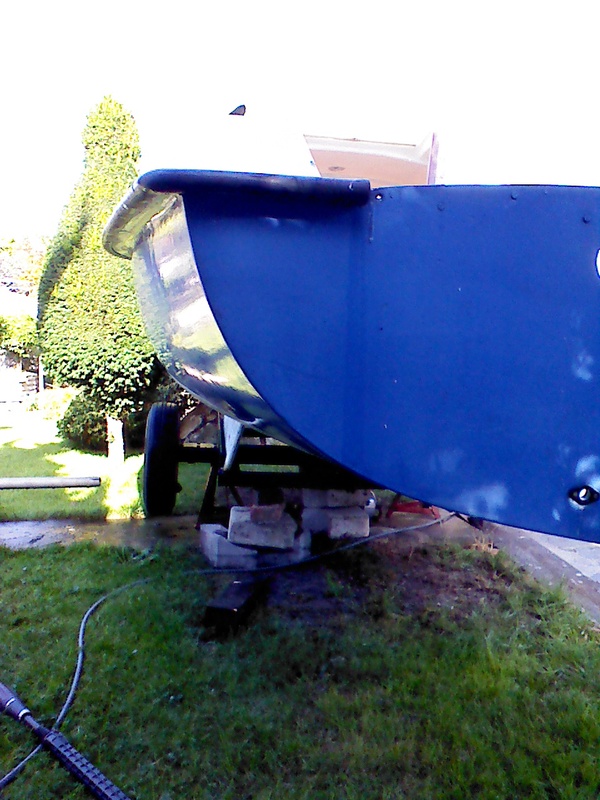 The topsides have been repainted in the same Toplac 105 blue and the underwater is in primer ready for antifouling. I have now come to the conclusion that I am not able to undertake the work to re-commission her, so time has come to find a new owner. 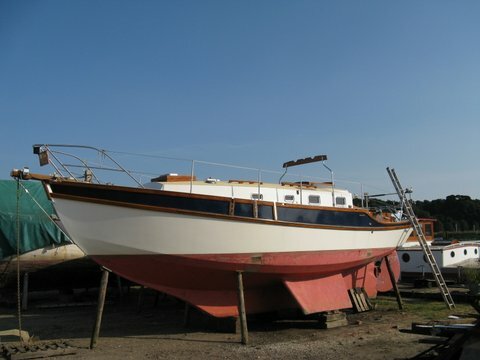 She is stored under a tarpaulin in Davis’s boatyard in Poole, and for a competent person I would estimate a couple of weeks’ work would see her back in the water. Tranona comes with a vast amount of gear, some of it new. Complete suit of sails. Main and genoa by Kemps (checked and serviced). New Kemp custom made stackpack and lightly used spinnaker. Original hank on foresails and storm jib are still serviceable! If you are looking for a potentially really good, sound Eventide this is the one to have! I am more interested in somebody willing to do a “proper” job than money, so asking £3000 which is less than the cost of the new engine. She could go into the water straightaway. Even the existing coating of anti-fouling would last a season. But in preference I would deal with some of the brightwork to save problems later. The topsides are coated with two-part paints. The chines have been recently "Wested" and the keel bolts changed 4 years ago. (There was nothing wrong with the old ones!). The brightwork is non-epoxy. Many of the fittings are not "commercial". My father was a scientific development officer with the Civil Service and so hand-making one-offs was routine. Some I have over the years replaced with ready made versions. She is rigged to be sailed from the cockpit. Even the mast can be lowered without leaving its safety. She was built to be sailed on the River Severn and so the Bermudian rigged mast had to be lower-able at a moment's notice because of bridges and cables. This also adds to her being a good trailer-sailer as you can trail with the mast, and all of the rigging attached, across the cabin roof, and then raise it at the top of the slip without much difficulty. After many years on the Severn (both river and tidal estuary) she was trailed to Cornwall on many occasions and also to the East Coast to (then) eoa. meetings. South Devon was her home for 10 or more years. She has even been to France when we lived there in the 00's. She was the occasional winner of the handicapped "sailing in company" event in the Blackwater. Bermudian rigged with running backstays. But she has an optional bowsprit so maybe that should be "cutter rigged". All standing and running rigging is present and in order. Two suits of sails including small jibs and Genoas. Both suits usable but her performance would improve with a new or serviced suit. The mast is hollow Colombian pine and is in two sections with a huge (3 t.p.i.) brass thread to join them! Cables for lights and VHF go up the centre of the mast. Steel bilge keels with "feet" to cut leeway and they help when drying out. Dural rudder plate which hinges up. Transom inset for 5 H.P. Mariner (included). Starts and runs fine but is not new. 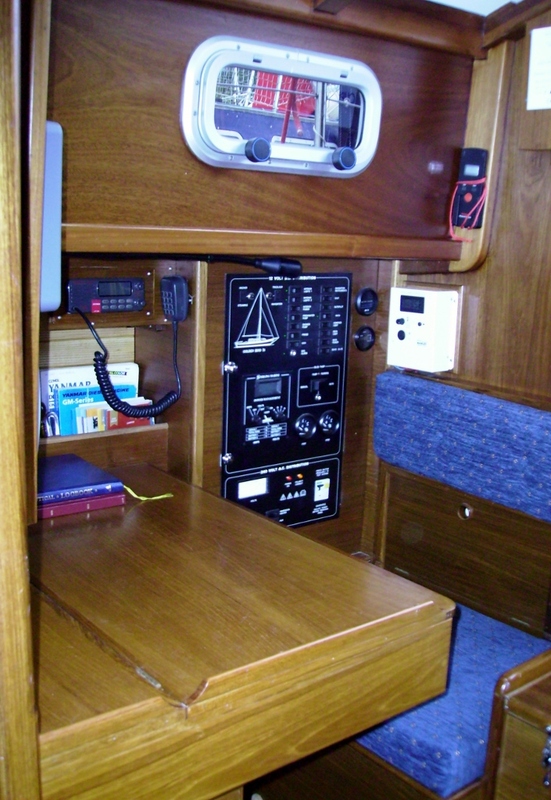 Bilge pump in cockpit locker. Mountings/boxes in either cockpit locker for 12 V lead acid batteries if needed. Cockpit canvas over the boom. Small solar panel on coach roof. Navigation lights. Lighting/charging coil on the outboard. Fenders + daymarks, etc. etc. Cable locker/water bottle storage in the forepeak. Two single bunks with centre joining piece. Removable mast support in the cabin for when in harbour. Boat hooks (one original in ash and screws together.) Oars for dinghy. She is presently in storage ashore locally (south of Hereford). She is on a 4 wheel braked trailer. The trailer would need "assessing" by a buyer as to its present legality/capability. 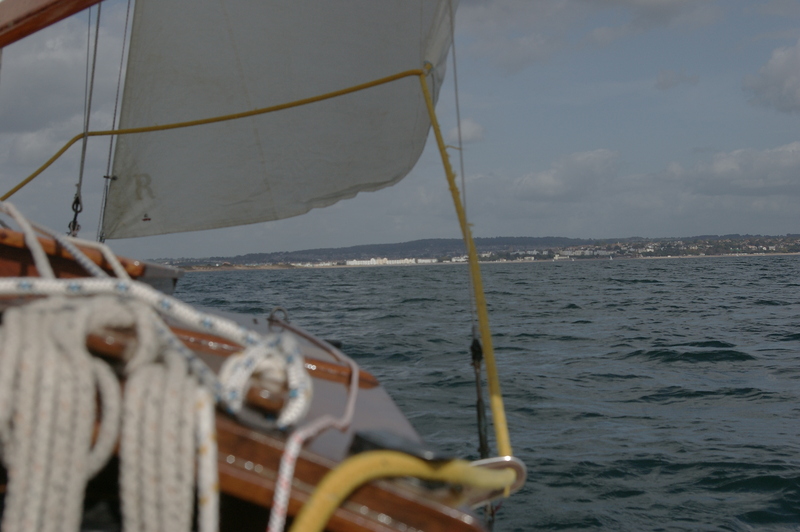 The trailer is fitted with a winch and between-keels storage for mast and boom etc. You can see a sample of the sorts of items sold by clicking here..
Or Here for second page!